At some point over the past few weeks, I've gotten it in my head that I must have dried pineapple from Trader Joe's. Little did I know, this craving would lead me on a fun adventure downtown with my Zoë June. (Now, when I say "adventure", we must remember that we are talking about stay at home mom who considers it an "adventure" to walk outside with the kids to get the mail). Nonetheless, the day started out with a fun surprise for Zoë. She was going to go to work with daddy! I volunteer every Tuesday morning in Peter's Kindergarten class and struggle to find a sitter for the one hour time slot. We decided to take a chance and send little Miss, armed with toys and movies, to daddy's law firm. It worked like a charm...and I got to spend some quality time teaching and interacting with Peter and his peers at school. Here's where the pineapple craving comes in. After saying goodbye to Peter (he unabashedly kisses me on the lips and tells me he loves me in front of his class. Please don't grow up!) I picked up Zoë and we headed to TJ's where she insisted on pushing the "baby cart" (customer in training). After loading up on far too many dried fruits, nuts, and trail mixes, we made it back to the inner warmth of the car. Don't you love cold Fall days where the sun is shining and your car is the perfect temperature to climb into? But I didn't feel like heading home. I love being downtown. I tried calling Brighton, but she was heading to lunch with her hubby (newlyweds...who can blame them?) 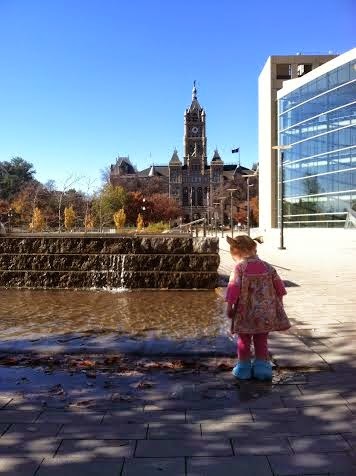 It had been such a long time since I'd been in the downtown Salt Lake City Library so I decided to hit it up. Zoë was going to love it! It was a pleasant surprise when I discovered that street parking was free. Hmm..Must be a Veteran's Day thing. You know what is also a Veteran's Day thing? A closed library. Darn. 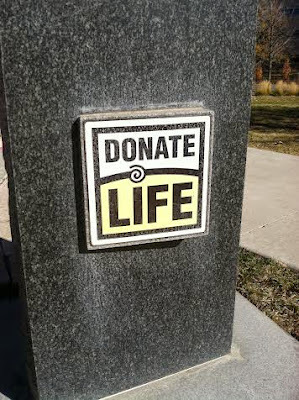 But then I remembered that Intermountain Donor has a "Donate Life" memorial section on the grounds of the library..and Lucy's name is etched in glass, along with hundreds and hundreds of others, because of her organ donation. 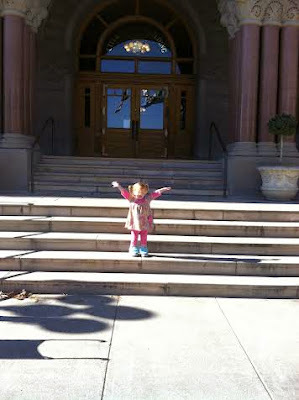 Zoë and I made our way to the corner of the library square while I searched frantically for Lucy's name. 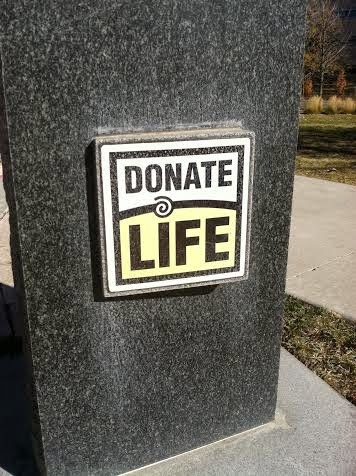 I'd seen it before, years ago, when we went to the dedication of the memorial. But there are so many names and they are difficult to read. I couldn't remember where hers was. Anxiety was building up inside of me as I scanned row after row of names. They are not in alphabetical order and I could not remember where to find it. I had this feeling that if I was lucky enough to find her name, it would be like she would come back to life again--just for a minute or two. It was like looking for her in a crowd of people. My eyes were scanning so quickly, my heart racing. Then suddenly, I hear Zoë's little voice, "LUCY!!" 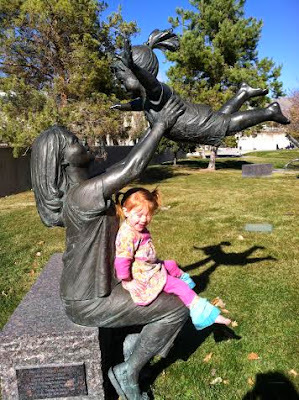 I raced over to find Zoë sitting here in "mommy's" lap, pointing up at "Lucy". She knew I had been searching for "Lucy" on the glass wall and she was so excited to let me know that she found her. I cannot tell you how it made me feel to hear Zoë say Lucy's name so many times. The reason I can't tell you how it made me feel is because I don't know. I'm still processing it. It was...like magic. No, really. You know when you watch a magician and you are AMAZED at the tricks he does, but part of you is disturbed and entirely curious HOW he (or she) does the tricks? That's how it felt. Let me hear you say it more, Zoë! The sound of her name! The sound of YOU saying her name! It's...beautiful. It's amazing. Do it again! But...why does it make me feel so sad and curious? Why does it feel so foreign and mysterious to hear you say it? Magic. Zoë found a "secret pathway" (a walkway made of engraved stones) and walked up and down it about 5 times. This particular stone stood out to me. On the walk back to the car, Zoë noticed the City Building across the street and her entire face lit up. "Castle!!" She really wanted to see the castle. We made our way there to discover that it was also closed. But Zoë made the most of the situation by curtsying to her crowd and waving at the common folk. 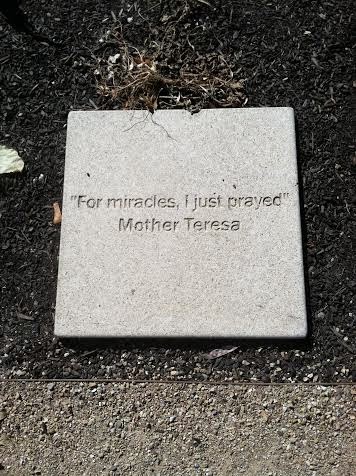 (She really did). 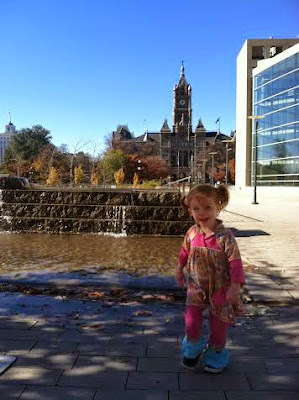 Who knew my craving for dried Pineapple would lead to such a glorious Fall day downtown with my sweet cheeks? The thought occurred to me, as I think back on the frantic way I scanned the memorial wall for Lucy's name--I didn't find it. I wanted so desperately to. I wanted to see her name engraved for all the world to see. But I had to keep an eye out for Zoë. I had to make sure she didn't run into the street or into the arms of the several homeless men hanging around. I didn't get the surge of pride moment I was hoping for when discovering her name. My life hasn't followed the "story" I had made up in my head. But I feel like I'm doing a pretty good job experiencing the new and wonderful story life has presented me. I don't want to waste time trying to change it or mold it into something I think it should be, or used to want. I want to let it be what it is. Dried pineapple and all the other wonderful, horrible things thrown in too. This is a beautiful post! It reminds me of the quote "We must be willing to let go of the life we have planned, so as to have the life that is waiting for us."